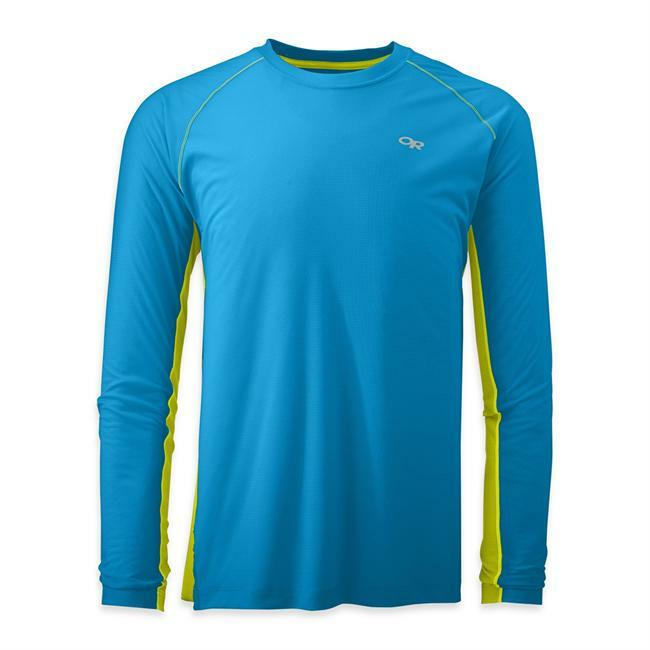 This shirt is a long sleeved, midweight, Merino wool/ polyester blend fabric, designed for active pursuits in cooler temperatures. 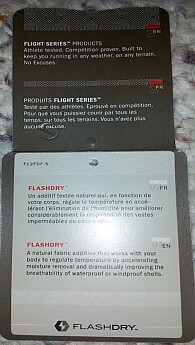 It also incorporates TNF FlashDry technology which aids in faster moisture wicking capabilities. I received two different shirts from The North Face for testing through the Trailspace Review Corps. In addition to the Aries long sleeve shirt, I received The North Face Better Than Naked Crew. Click the link to see the review. While the Better Than Naked Crew (BTNC for the rest of the review) is designed for active pursuits in warm weather, the Aries is best for aerobic activities in cooler conditions. 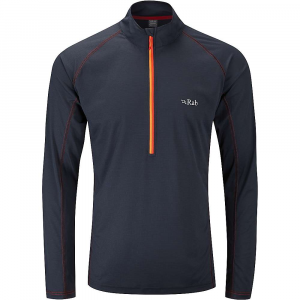 It can also be part of a layered system consisting of a thin base layer, the Aries shirt itself and a lightweight shell to top it off. Both shirts, the Better Than Naked Crew and the Aries, are part of The North Face's "Flight Series" clothing line. 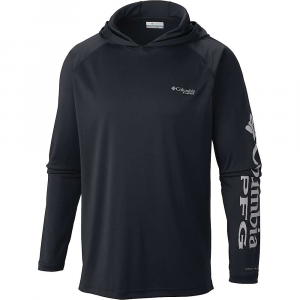 The shirt's inner label indicates it is comprised of 38% polypropylene mesh, 33% Merino wool and 29% Minerale (tm) polyester. It can be machine washed and laid flat to dry. You don't want the wool to shrink! All seams are perfectly (as usual) flat stitched as with the BTNC and again the sleeves are raglan style. 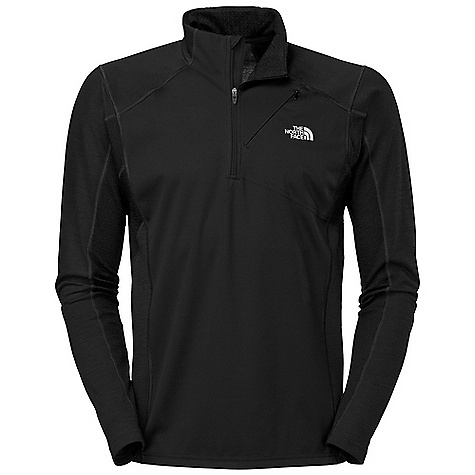 The North Face logos are positioned in the same manner as on the BTNC. The shirt's dry weight is 9.1 oz according to my digital nutrition scale. I received the extra large version of the Aries and the fit is accurate. I liked the sleeve length of this shirt. I have an issue with most manufacturer's long sleeve shirts because I have longer than average arms for my height. 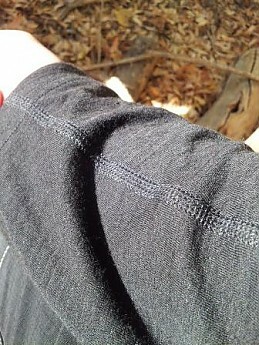 The problem I run into with size "large" long sleeve shirts in general, is the shirt fits great on the torso but the sleeves stop at my wrist. So if I raise my arms out to my sides or over my head, the sleeve ends up being somewhere around the middle of my forearms. A real inconvenience in colder conditions. So I have to choose an extra large size which gives me the longer sleeve length, but, a looser fitting torso. With this shirt, I could have went with a "large" because the sleeves were plenty long. The sleeves easily extended past my wrists. I know there may be some folks out there who would find this to be a hindrance but it suited me just fine. I noticed the shirt is tapered somewhat in the torso and it wasn't baggy in the midsection despite being an extra large. There wasn't much bunching of the material when I tightened the waist belt of a backpack as with other extra large, long sleeve shirts I own. This leads me to believe the shirt has a fitted design and is not as loose as the BTNC. What's interesting about this shirt is the Merino wool. 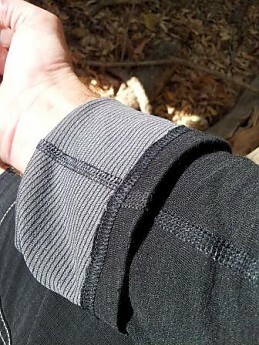 The wool makes up the shirt's lining as you will see in an upcoming photo. Wool in general is itchy or sometimes scratchy against skin. I wouldn't classify this shirt as being itchy or scratchy but somewhere in between, hence, the term "scritchy", as I stated in the cons. It's not annoying, but, you know it's there. I took the shirt on a backpack trip into the Pecos Wilderness of New Mexico in October 2012. The conditions were sunny skies, temperatures ranging from the mid 30s F in the morning to the mid 50s F in the afternoon and the humidity never made it above 30%. The elevation ranged from 9600 ft ASL to 11,500 ft ASL. This shirt was the only shirt I used while I was there. The pack on this trip was a 60 liter Gregory Teton (discontinued). I hiked 7 miles to an elevation of 11,500 ft. The winds were gusty the entire time. At some places, the wind gusted to 50 mph across open areas and more so as I gained elevation. At 11,500 ft, the wind was a constant 20 to 30 mph with higher gusts. Keep in mind this shirt is not designed to block the wind. As I hiked I could feel air movement through the shirt. The breathability seemed excellent. I did sweat a little bit, despite the cool conditions, in areas of my body which came in contact with the pack, such as, under the shoulder straps, the chest strap and mid to lower back areas. However, I stopped and removed my pack, twice along the route, I immediately felt a cooling effect and there was a need to wear my down sweater so I wouldn't get chilled. The first time I stopped, it was along a creek in a dense portion of the forest and I was sheltered from the wind. The second stop was in a more exposed area which was quite windy. Upon reaching my destination, I began setting up my tent while wearing the down sweater. I would say in a span of 20 or so minutes the shirt had nearly dried to the touch except for my lower back. That area was slightly damp but after a short time the shirt was completely dry. The temp at that time was around the mid 40s with gusty wind, but I was more than warm enough wearing a beanie, the Aries shirt, a Rab Cirrus windshirt and over the top of it all was the down sweater. I took the shirt on a trail run one morning. The temp was in the 50s, sunny skies, low humidity and light winds. The shirt did admirably, as expected. It breathed well the entire time and I never felt hot. It did well at keeping the chill off of me. I did perspire somewhat, but, never enough that it overloaded the wicking properties of the shirt. I took it mountain biking one morning in similar conditions. Since I can maintain a faster pace on my bike versus running, I was curious to see how that would affect the shirt in keeping me from getting chilled. On cooler mornings I normally wear a thin wind shell over my shirt until I get warmed up but this morning I decided against it. At the start of the ride I definitely felt the cooler air through the shirt and it took me quite a while to warm up. I actually had to stop in a sunny area to warm up a bit. 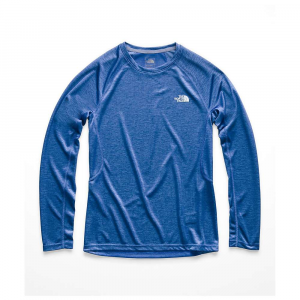 In my opinion, TNF Aries long sleeve shirt with Flashdry is an excellent shirt for active pursuits in cooler climates or conditions. Since I have no scientific way of testing the Flashdry technology, I can't directly attest to whether or not the Flashdry is working. However, the shirt breathes well, dries quickly, and the wicking properties are excellent. 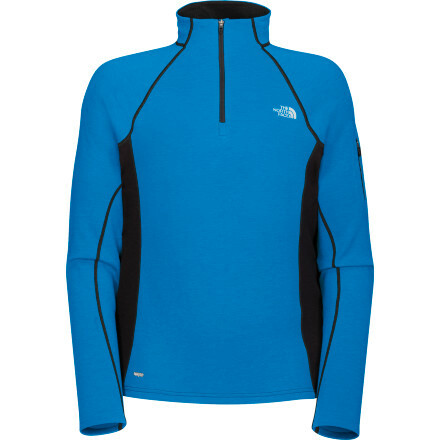 The shirt looks good, the seam stitching is excellent, and overall The North Face puts out a quality product. The MSRP for this shirt, according to the tag, is $99. A little pricey, but otherwise, a great shirt. 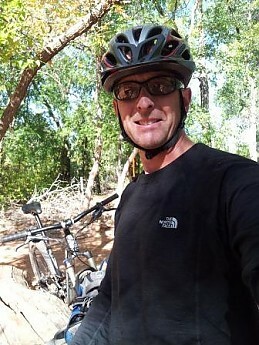 Thanks for testing and reviewing and sharing with Trailspace, Rob! Looking forward to the next gear test! 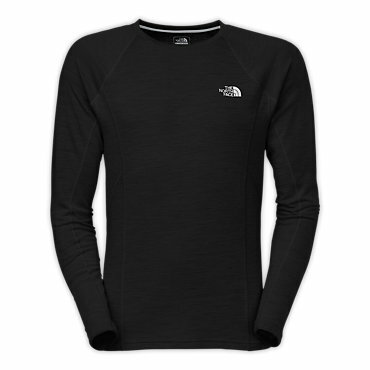 The North Face Aries Long Sleeve is not available from the stores we monitor. It was last seen November 17, 2013	at Mountain Gear.